Good question. Is it a publishing platform, a social network, a distribution channel, a 21st century version of the op-ed page, or something else? With a continuously evolving feature-set, Medium defies simple classification. Perhaps it is best to think about Medium in terms of what you can accomplish with it. With a new federal-friendly terms of service being rolled out this week, now is a good time to reconsider Medium’s use (and usefulness) in government. I talked with a handful of government agencies to better understand why and how they use (or intend to use) Medium. The attraction seems to coalesce around three key areas: content discovery, simple design, and features that foster conversation. Even if you’re not a regular Medium user, chances are that you’ve stumbled upon the site since its launch in 2012. Remember January’s viral hit “A teenager’s view on social media (written by an actual teen)”? Or perhaps you noticed when President Obama broke with tradition and shared a sneak peek of his State of the Union remarks on Medium? These examples show that, with the right content, Medium can be a powerful place for attracting attention. Medium was last reported to be averaging 25M unique visitors per month. That’s a lot of potential eyeballs. Medium offers an opportunity to reach people that may not be engaging with you on other platforms. Jared Benoff at the Department of Labor says Medium helps the agency expand its footprint and, specifically, reach a tech-savvy audience that is very engaged online. It is less about the total number of potential readers Medium offers and more about their readers’ tendency to stick with content and engage with it. At the Peace Corps, Erin Ruberry says the organization chose to showcase its in-house experts—such as career services and digital innovation—who don’t often get the spotlight. Medium offers an opportunity to reach people who might not otherwise have the Peace Corps on their radar. If Medium is a “place to tell stories” it makes sense to prioritize narrative content. At Labor, content is selected for publishing on Medium based on its storytelling quality—in terms of both text and images. Some agencies focus on feature article and special reports (“things you’ve already worked hard on” as the National Science Foundation’s Jessica Arriens says) while others post more frequently and with looser criteria. As more organizations begin sharing content on Medium, it will be interesting to compare notes about what content performs best and why. A differentiator for Medium compared with other social sites is that “high quality content” is prioritized over the date a story is published. Medium’s editors select content to be featured on the main page and engagement is measured through “total time reading.” Interestingly, how long a story takes to read is sometimes easier to spot than the date the piece was published. 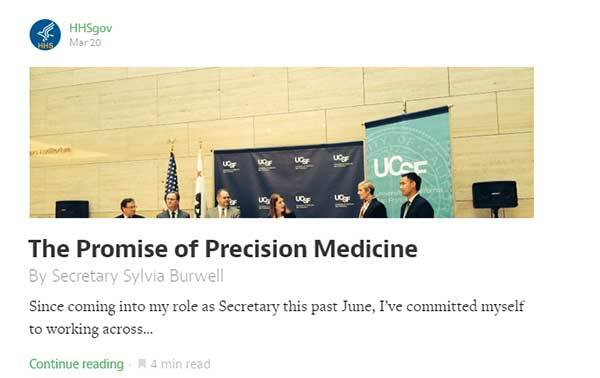 At Labor, content that is published to Medium is also cross-posted on the agency’s own blog. The Peace Corps has a similar cross-posting strategy. Publishing in both places means you can compare performance metrics on each platform. If you cross-post, don’t forget to link from one channel to the other to help grow readership. Bonus: Should Medium ever go away, your content is safely housed on your own domain. “A better way to tell a beautiful story.” This is how Labor’s Jared Benoff describes the key benefit of Medium. Notice there are two sides to this selling point: the reader experience and the authoring process. Erin Ruberry says the Peace Corps was inspired by the First Lady’s use of Medium as a travel journal peppered with bold, full-screen images. She points to the platform’s “clean” and easy to read interface. Medium’s simple (almost stark) black-and-white design pairs well with large, bold images to make your story pop. 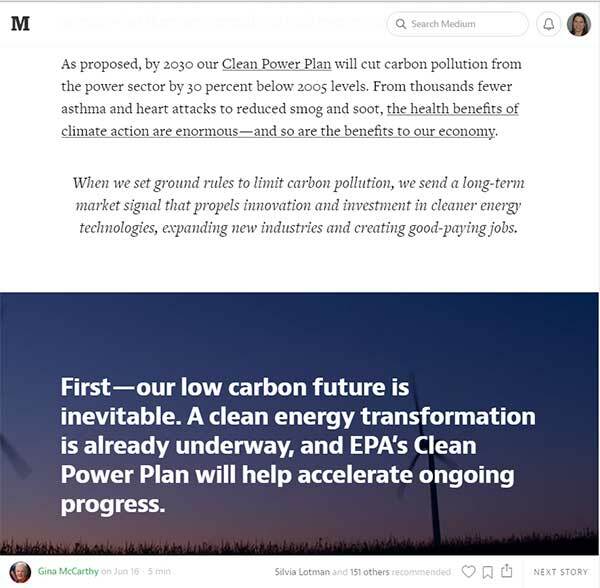 Although formatting options are limited, Medium’s modern image layouts (such as a parallax blur effect) can be hard to replicate on the older blog platforms that government agencies have adopted. Labor worked in collaboration with Medium editors to craft content for the Aspen Ideas festival, including how to use large images for maximum impact and make points of emphasis stand out. Medium’s authoring tools are also dead simple. Text formatting in the WYSYWIG editor is a snap and it is just as easy to format a pullquote, upload and place an image, and embed a video or even a tweet by simply pasting a link. Authors can publish individual stories or contribute to multi-author publications (which have the added benefit of access to the letters feature—essentially email notifications to a publication’s followers). Erin Blasco at the National Museum of American History has high hopes that Medium could provide “real conversation” and not just generate spam. “If I really want to spread and spark a conversation,” she says, “it seems like Medium is a better fit than a longer-form post on my organization’s blog.” But why? What is it about Medium that could help foster dialogue? Notes, Highlights, and Responses…Oh My! Medium’s features change often. Follow https://medium.com/the-story for updates on the platform itself. While conversation-focused features like notes and responses are baked in to Medium’s platform, that doesn’t mean writers are seeing a lot of interaction on their stories. Why not? Medium’s Matt Higginson says that “just like any community, the more active you are the more meaningful interactions you will experience.” (See more advice from Matt on encouraging conversation.) Explicitly inviting people to leave notes, comment, and highlight could be a good first step towards fostering more interaction with your content. If conversation is a key goal, you might also consider focusing your content strategy on crafting stories that are well-suited to discussion or debate. What do you think are Medium’s core strengths? What areas of opportunity are you hoping to explore for your organization? If you’re already using Medium to publish, are you seeing readership or engagement metrics that justify your efforts?